Biological reconstruction by use allograft or recycled autografts exhibit advantages in well host bone-graft incorporation, restore bone stock, good size and shape adaptation and gain better longevity. After neoadjuvant chemotherapy, patients received wide tumor resection and reconstruction by recycle autografts. For the ECIR-treated autografts, the bone segment irradiated by a Linear Accelerator with a single dose of 150-300Gy. For the freezing-treated autografts, the resected segment was frozen in liquid nitrogen for 20 minutes followed by slowly thawing. After the treatment, the bone segment was returned immediately for continuing the reconstruction surgery. Between January 1998 and December 2012. 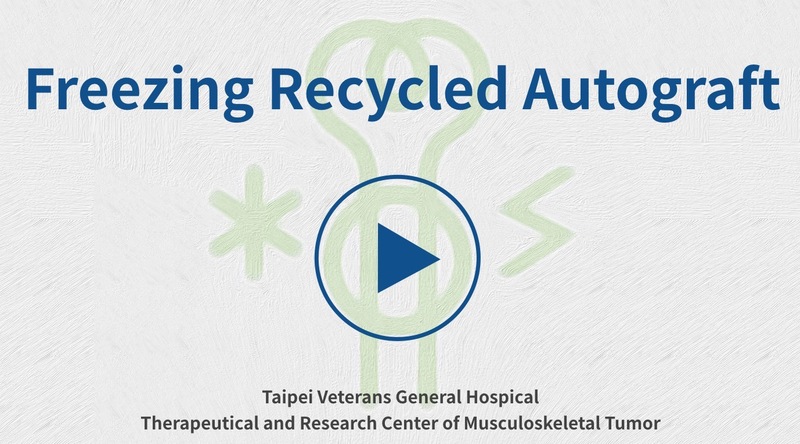 More than two hundreds of sarcoma cases were reconstructed by recycle autografts. More thant 90% of grafts could achieved solid biological union in nine months and finally restore real bone stock. The five-year limb survival rate is 93% and graft survival rate is 88% which is much better than tumor prosthesis (60-70%). The average limb functional score is 88%. No tumor recurrence from the recycled autografts. The five-year patient survival rate is 83%. Thus, biological reconstruction is a safe and ideal method for limb reconstruction. The average Limb survival rate is 93% and patient’s survival rate is 83%. The average functional score is 88%. Common complication including nonunion (10%) and infection (8%). Most of complications were occurred within the first 3 years after surgery. Afterwards the complication rates were significantly decreased. Most of the complications could be managed by additional surgery. After patients received wide resection of bone sarcoma. A huge bone defect will be occurred. Orthopedic tumor surgeon will reconstruct the bone defect by real bone, such as allograft or recycled autografts. high dose of irradiation (ECIR) or freezing are the most efficiency method for the recycled method. For the ECIR-treated autografts, the bone segment was tightly wrapped with sterile drape and sealed in doubled-layered plastic bags. The sealed bone segment was irradiated by a Linear Accelerator with a single dose of 150-300Gy. Radiation field was ensured to adequately cover the tumor-bearing bone segment. The treated bone segment was returned immediately for reimplanted and fixed by osteosynthesis materials. For the freezing treatment, the resected segment was frozen in liquid nitrogen for 20 minutes followed by slowly thawing at room temperature for 15 minutes and 10-minute successive thawing in distilled water. The freezing-treated autografts were reimplanted and fixed by osteosynthesis materials. 1. infection requiring antibiotics or surgical debridement. 2. Graft fracture requiring repeat surgical fixation. The procedure cost is about 30,000 ~ 1,525,000 NTD, prices are subject to change without prior notice, need to pay in accordance with the actual medical expenses.